The last four words of Gilmore Girls are a disappointment. There’s an obvious flaw to the last four words. To read the exact opposite opinion of Gilmore Girls’ last four words, click here. In 2006, Amy Sherman-Palladino, the creator of Gilmore Girls, told TV Guide that she knew the exact four words that would end the series. She didn’t get to use them. Sherman-Palladino was no longer working on Gilmore Girls during its final season, which aired the next year. In the time since, thanks to flame-fanning from both Sherman-Palladino and actual fans, the #final4words have taken on an outsized silhouette in Gilmore Girls lore, becoming the ideal ending, the right ending, the ending the series deserved but didn’t have. With the debut of Gilmore Girls: A Year in the Life, the revival of the show that premiered on Netflix this weekend, the final four words are finally out there in the world. And the first thing to know about them is that there are only two. The last words of (this installment) of Gilmore Girls are “I’m pregnant,” words delivered by Rory to her mother Lorelai, as the two plaintively sit on the steps of the Stars Hollow gazebo. (They are preceded by Rory saying “Mom” and Lorelai saying “Yeah,” but that seems like a pretty ticky-tac way to get to four to me.) As my colleague Marissa Martinelli has persuasively argued, the final words are perfect, because they are surprising, substantive, both forward-looking and backward looking. They deftly lay out an unexpected but apt future for our beloved heroines, furthering a story about the magic of mother-daughter relationships without overexplaining it. The last words are pretty lovely—but as soon as they were uttered, I started thinking, “Wait, those were also supposed to be the last words of the series when Rory was 23?” At the end of Season 7, Rory was 23. At the end of A Year in the Life, she is 32. You wouldn’t necessarily know it from the revival, which treats Rory like a lost twentysomething, still struggling to become a writer, still in a dead-end love affair with rich boy Logan Huntzberger, but it is nonetheless the case. Rory is 32. Getting accidentally pregnant at 32 is not the same thing as getting accidentally pregnant at 23, especially within the context of Gilmore Girls. Lorelai had Rory when she was 16 and is devoted to ensuring that Rory not repeat her mistakes. Lorelai is wildly ambitious on Rory’s behalf and wants Rory to have the high-flying career as a famous writer that Rory seems to want. For a 23-year-old fresh out of Yale and eager to start a professional life, getting pregnant is a real, if not definitive, impediment to ambition. At 23, Rory’s pregnancy would have been truly complicated, an occasion for both her and Lorelai to feel happiness and regret. At 32, not so much. Rory’s had a decade to make it as a writer, and she has, per the show, a New Yorker Talk of the Town piece to show for it. She is a flibbertigibbet, a peripatetic woman without a permanent address and a number of half-finished projects and unsuitable boyfriends to her name. She is demoralized by the idea of teaching and running the Stars Hollow newspaper permanently, but can only find creative succor in cannibalizing her mother’s life for fiction. At 32, Lorelai had raised a bright and kind 16-year-old and run her own successful small business. At 32, Rory has accomplished a fraction of what her mother had while living on other people’s money. Rory sounds conflicted when she tells her mom about the pregnancy, but in this context, a baby isn’t bittersweet, it’s a clarification: Time to get your life together, Rory, cause you can’t seem to do it on your own. Lorelai never wanted Rory to become a young mother. At 23, she would have been. At 32, she’s not. Rory’s mistakes, and she’s made plenty, are all her own. 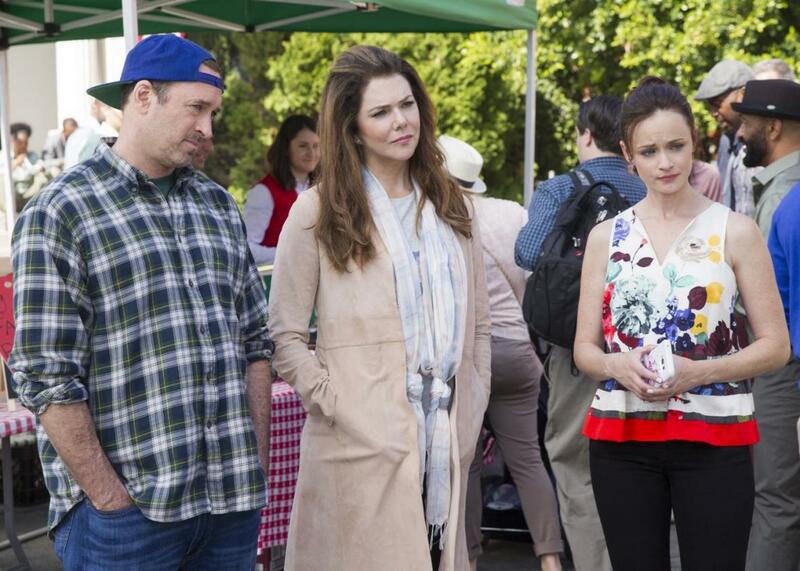 But, somehow, despite this, Rory seems poised to live out Lorelai’s storylines. It’s not clear who the father of Rory’s unborn child is. It could be Logan. It could be a guy in a Wookiee costume Rory had a one-night stand with. It could be someone else altogether. But my money is on Logan, only because the parallels to Rory’s father Christopher are so great. Logan, like Christopher for Lorelai, is a real love in Rory’s life, though not, if you ask anyone but Rory, the love of it. He’s a very rich man who means well but never quite well enough. It’s easy to imagine that Logan, like Christopher, would acknowledge and pay for his child, without actually deigning to raise it. Meanwhile, the revival sets Jess up as Rory’s one true Luke, showing us that he gets her and still loves her, intimating that he’ll likely be lurking around in flannels until she realizes she loves him too. At 23, Rory turning into Lorelai has an element of pathos. At 32, it seems like Rory could do a lot worse. There’s one final irony to the final four words: If Amy Sherman-Palladino had been able to use them when she wanted to, at the end of Season 7, it would have precluded a revival—or given us a revival with an annoyingly precocious tween in it (and that didn’t work so well in Seasons 6 and 7 with Luke’s daughter April). By being denied the chance to use the words when she first wanted to, Amy Sherman-Palladino got to give us a whole new season of the show, unburdened by a cutesy 8-year-old. When Netflix coughs up the money for the next revival, we’ll have an opportunity to see just how irritating the Gilmore Girls becomes with a next-generation Gilmore girl in the mix.